Ok, so it’s not quite Chinese New Year yet (the festival starts on 10th Feb this year) but I get excited about these things. Not least because I am obsessed with all things Chinese! I thought it’d be fun to open this post with not only some traditional Chinese characters (which I hope are right!) but with a little bit of Pinyin. For those of you who don’t know, pinyin is the official system used to transcribe the sounds used to create Chinese words into latin script – in other words it a way of writing out the sounds that make up Chinese words. Thats the funny combination of letters and symbols you see below the traditional Chinese characters. I’ve been learning Chinese (mandarin) for about 5 or 6 months now and while I am very much still a beginner, I am surprised at just how easy I have found the language to learn. Once you’ve grasped pinyin you’re over one of the hardest hurdles! My course is purely a “spoken word” course, so I haven’t learnt how to write any Chinese characters yet, but I’m still really enjoying getting used to a tonal language, and a language where for once the uses of tenses (or lack of use…) and the sentence structure actually makes sense to me! Maybe I will be a multilingual person yet. My love of the Chinese language is just one reason why I’m really looking forward to celebrating Chinese New Year this year. It’s also a great excuse to try some new and exciting Chinese recipes like the one I’m sharing with you today. But I also like to think of Chinese New Year as my New Year. This may sound a little silly, but with all the hustle and bustle of Christmas (which…we all known I LOVE), I often find New Year a bit of a letdown, a disappointment. But, by Chinese New Year, things have always seemed to have picked up! Usually I would have finished any winter exams by now (unfortunately this year I don’t finish until 19th of Feb…eek! ), any winter colds would have started to lift, and the old money situation has usually started to ease. So, Chinese New Year is often way more happy and full of hope and prosperity than the traditional December 31stcelebrations! I also have my own reasons to enjoy January 1st which don’t surround New Year’s Resolutions. January 1st is mine and Jon’s anniversary, and this year we celebrated our 8thyear together! (Confession…I had to double check with him how many years it’s been, it’s been so many haha – bad girlfriend alert!) So often we leave New Years party’s early and on New Year’s Day we are the only people heading out to a restaurant as people stay at home watching yet another Indiana Jones movie on TV. So there you have it, myNew Year, is Chinese New Year! 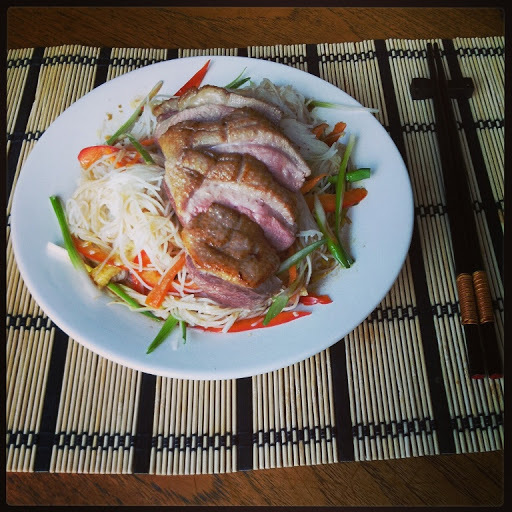 Before I share with you the scrummy Duck Salad recipe, I just want to tell you a little bit about Chinese New Year traditions. First of all, this year is the year of the dragon! Website mandarin.about.com tells a lovely story which is used to help Children remember the order of the animals. People born in the year of the dragon are thought to be lucky! (As a result there’s often a bit of a baby boom when the year of the dragon comes around! The dragon is also meant to represent good fortune, so I’m hoping this one will be full of luck and good fortune for all of you! Red envelopes are also another feature of Chinese New Year. These envelopes are given to children and unmarried adults. They contain money (new notes, and always an even number), but if you’re ever in China for New Year, be careful not to include either 4, 40 or 400 as the number 4 also sounds like the word for death so it is very unlucky!!! Fireworks are also mandatory as they ward off evil spirits! You can watch some fabulous firework displays in China this time of year. We will be celebrating in our own little way this weekend with an indoor firework show. So, history lesson over, here’s my recipe. It’s a little bit more complicated than normal so I’ve broken it down into it’s two component parts. 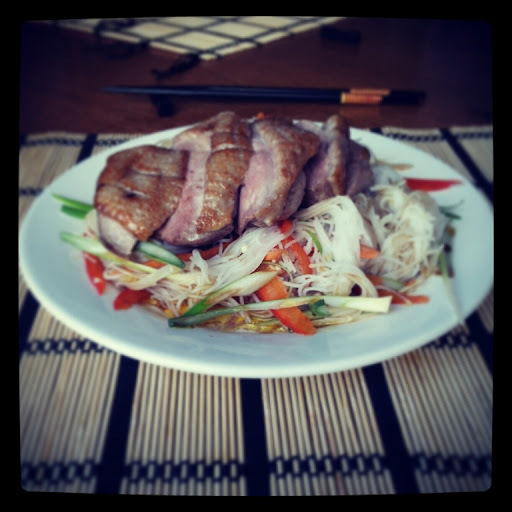 Firstly, here’s how to tea smoke your duck breast. Secondly, I’ll share my recipe for the simple yet flavoursome rice noodle salad. Enjoy! 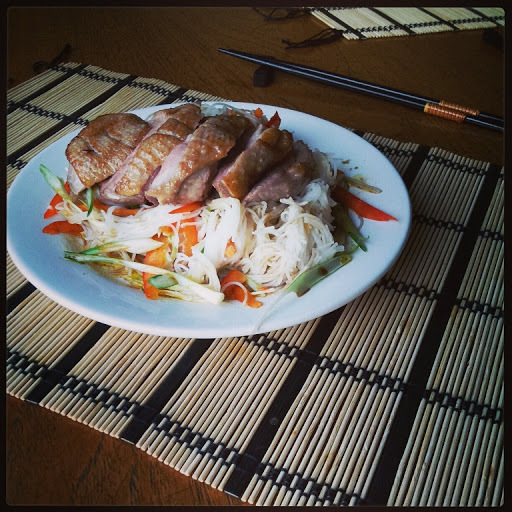 *For the tea smoked duck:*First things first, line your wok with heavy duty tin foil. Empty 2 tea bags, 1 tbsp of brown sugar and a tsp of Chinese five spice into the wok. In a second, smaller, frying pan heat a little oil. Score the fat on your duck breast in a criss-cross pattern and place, fat-side-down into the heated oil. Let this cook for a few mins until it has crisped up and is golden. Whilst the fat of the duck is crisping up, place a wire rack over the wok and then place the lid on top ensuring there are no gaps for any steam/smoke to escape. Turn the heat on high and begin “cooking” the tea. Once the fat has crisped up and smoke has begun to form under the wok lid, transfer the duck to the wire rack. Place the lid back on top and let the meat smoke for 12-15mins. Once cooked allow it to rest for 8mins or so, slice diagonally and serve. For the salad: Cook the rice noodles as per the instructions. Once cooked, toss with the thinly sliced vegetables and the coriander leaves. Mix the ingredients for the dressing in a bowl and drizzle over the noodles/salad vegetables. Sprinkle over some sesame seeds and serve. Top tip: this is going to create a lot of smoke! Make sure you’re in a well ventilated area and avoid wearing clothes you don’t want to smell of tea afterwards!!! If you want to impress your friends and family (or the Chinese take-away…) by knowing some of the lingo, this website has a great table breaking down common Chinese phrases with the pinyin, Chinese characters, and audio files so you can hear how it is meant to sound. But what are your plans for New Year? Do you always order a Chinese take-away or cook your own? Perhaps this year is the first year you are celebrating! Let me know in the comments below.